The imagePROGRAF iPF9400S Large Format printer for commercial photography, production, proofing and signage. The iPF9400S delivers the performance and versatility you need to produce profitable, high-quality output in less time. With low running costs, enhanced colour matching tools and faster speeds, the iPF9400S would be a welcome introduction into any busy environment. If you want to achieve high-quality large-print formats, Canon 8 colour Graphic Arts iPF9400S Printer is the one for you. 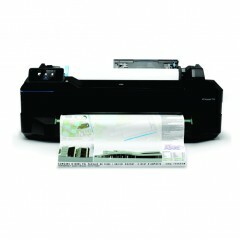 It can print large-scale adverts and posters up to 60-inch borderless printing format. Also, with its colour density sensor, this printer can detect colour density in just 15 minutes, making your printing jobs faster. Since it is designed for printing photos for marketing and advertising purposes, it is guaranteed to deliver premium quality prints in full and vibrant colours with the use of the 8-ink colours and the LUCIA EX Ink System, with its unique anti-scratch feature. Aside from those mentioned above, there are more features that you must know that Canon 8 Colour Graphic Arts iPF9400S Printer has. Aside from borderless printing, it is now possible to print high-quality output with lesser ink consumption. Also, activating this printing mode results in a faster printing process; faster than the 12-colour Canon Printer series. Canon 8 colour Graphic Arts iPF9400S Printer is designed with a large ink tank that can store up to 700 ml ink capacity. It also has a distinct sub-ink tank that can be utilised for replacement without having to pause or stop the printer. Also, it is equipped with a 250GB hard drive memory to store files and data to be printed, allowing for continuous printing and file recovery for reprinting. What else can you find in a high-end graphic printer other than its automated accounting system that will help you calculate printing costs? Well, it utilises a PosterArtist Lite software application that can give you the edge in working with high-quality large-scale printing jobs professionally and quickly. Make high-quality posters for any kinds of business with the use of Canon 8 Colour Graphic Arts iPF9400S Printer, the most cost-effective, efficient, and professional printer in the world of advertising!